“We, the Black People of London have called this demonstration in protest against constant police harrassment which is being carried out against us, and which is condoned by the legal system. The Mangrove was a restaurant that opened in Notting Hill, quickly becoming a hub for the West Indian community. The police repeatedly raided the space, claiming it was a drug den in spire of never finding drugs. 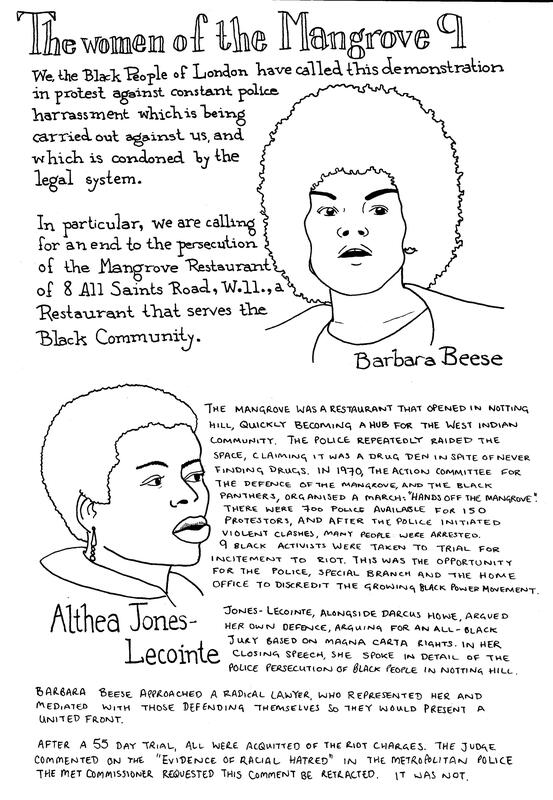 In 1970, the Action Committee for the Defence of the Mangrove, and the Black Panthers, organised a march: “Hands Off the Mangrove.” There were 700 police available for 150 protesters, and after the police initiated violent clashes, many people were arrested. 9 black activists were taken to trial for incitement to riot. This was the opportunity for the police, Special Branch and the Home Office to discredit the growing Black Power movement. Jones-Lecointe, alongside Darcus Howe, argued her own defence, arguing for an all-black jury based on Magna Carta rights. In her closing speech, she spoke in detail of the police persecution of black people in Notting Hill. Barbara Beese approached a radical lawyer, who represented her and mediated with those defending themselves so they would present a united front. After a 55 day trial, all were acquitted of the riot charges. The judge commented on the “evidence of racial hatred” in the Metropolitan Police. The Met Commissioner requested that this comment be retracted. It was not.